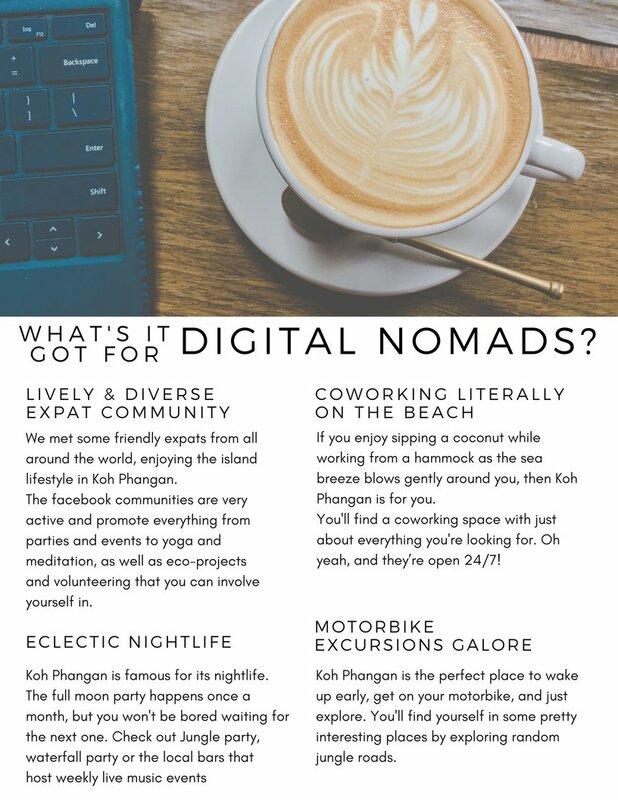 WHAT DOES KOH PHANGAN OFFER DIGITAL NOMADS? 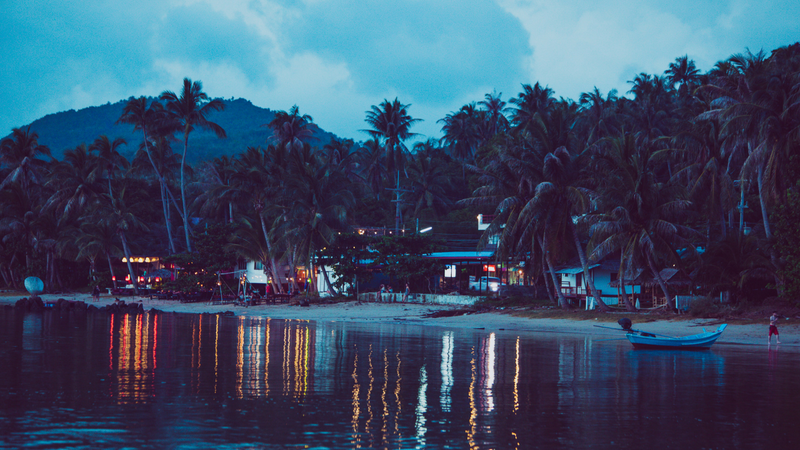 Koh Phangan was one of the first places we fell in love with in Thailand. We ended up living here for 3 months in a tiny bungalow just 10 steps from the beach. Before coming here, we’d heard that Koh Phangan has a reputation for being overrun with wasted backpackers, full moon parties, and drug-fueled debauchery Well, only some of this is true. 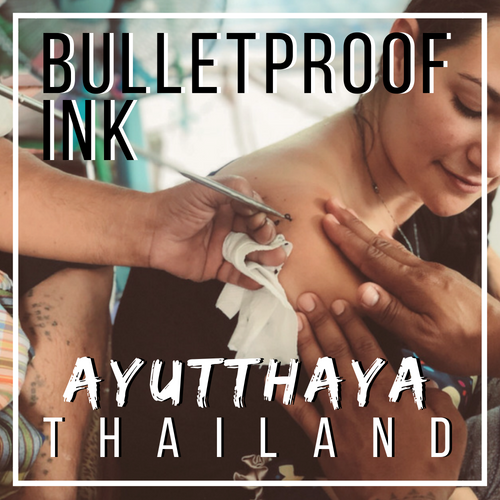 The reality is that the Full Moon Party chaos happens at the southern tip of the island and the chaos lasts only a few days a month. There are many other more peaceful areas on Koh Phangan where you can stay far away from the madness and simply enjoy your relaxing island lifestyle. 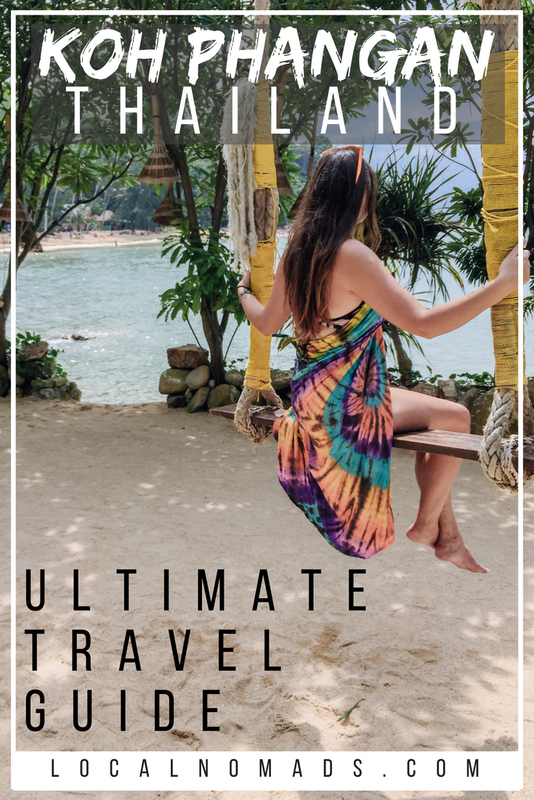 A typical day for us included waking up early for beach time, afternoons working from the front porch of our bungalow or from any of the lovely local cafes, daily sunsets at the beach, and evenings at the local rasta bar. 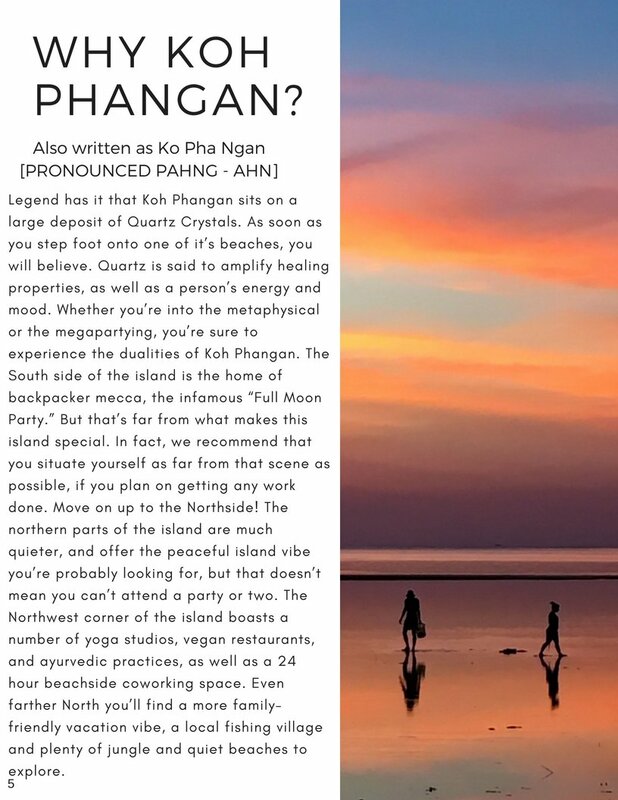 Koh Phangan has a little something for everyone whether you’re into the “conscious” scene, or the “unconscious” scene. Get FREE access to the entire 45 page guide right now! Legend has it that Koh Phangan sits on a large deposit of Quartz Crystals. 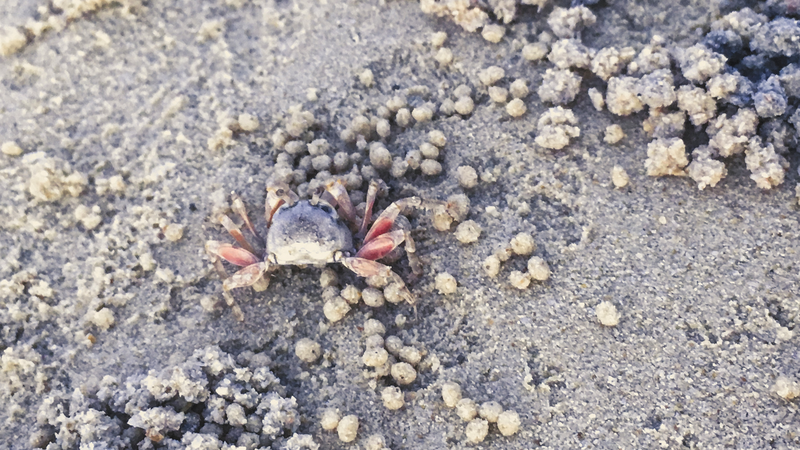 As soon as you step foot onto one of it’s beaches, you will believe. Quartz is said to amplify healing properties, as well as a person’s energy and mood. 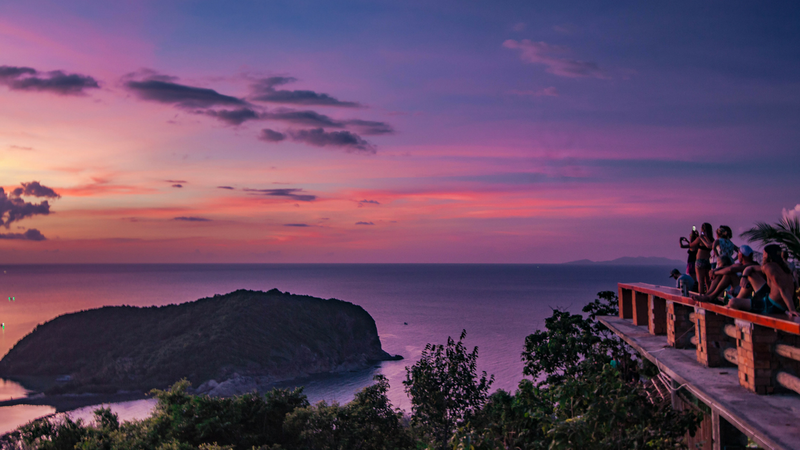 Whether you’re into the metaphysical or the megapartying, you’re sure to experience the dualities of Koh Phangan. 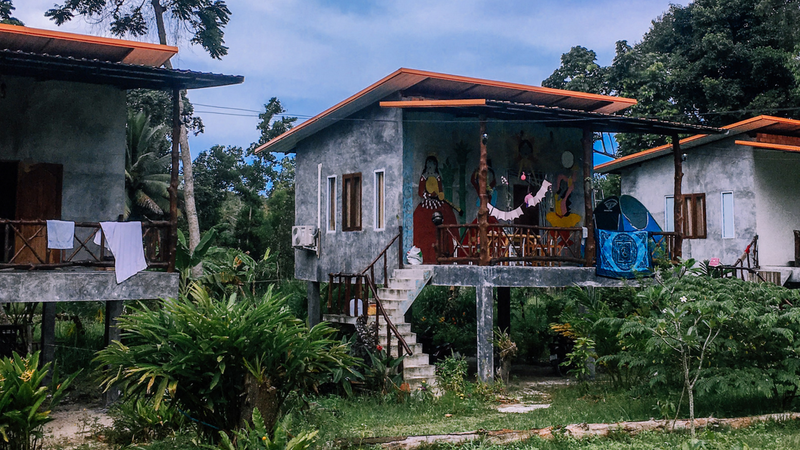 The South side of the island is the home of backpacker mecca, the infamous “Full Moon Party.” But that’s far from what makes this island special. In fact, we recommend that you situate yourself as far from that scene as possible, if you plan on getting any work done. Move on up to the Northside! The northern parts of the island are much quieter, and offer the peaceful island vibe you’re probably looking for, but that doesn’t mean you can’t attend a party or two. 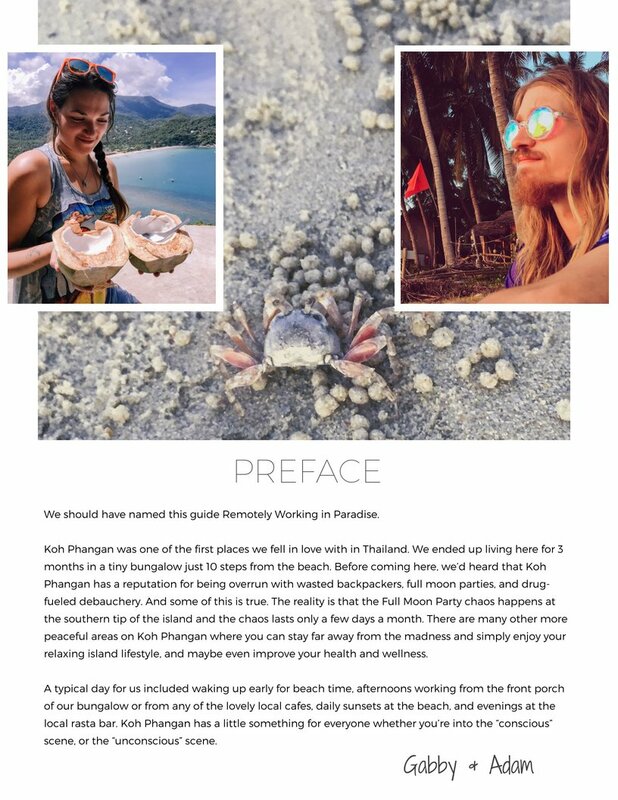 The Northwest corner of the island boasts a number of yoga studios, vegan restaurants, and ayurvedic practices, as well as a 24 hour beachside coworking space. 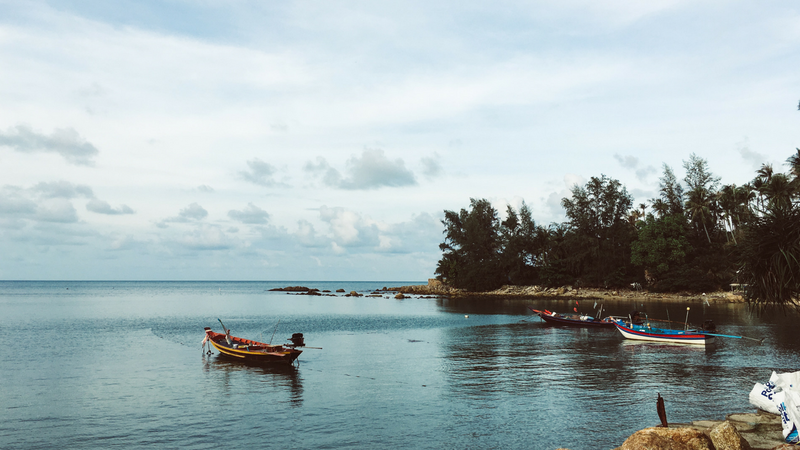 Even farther North you’ll find a more family-friendly vacation vibe, a local fishing village and plenty of jungle and quiet beaches to explore. We met some friendly expats from all around the world, enjoying the island lifestyle in Koh Phangan. 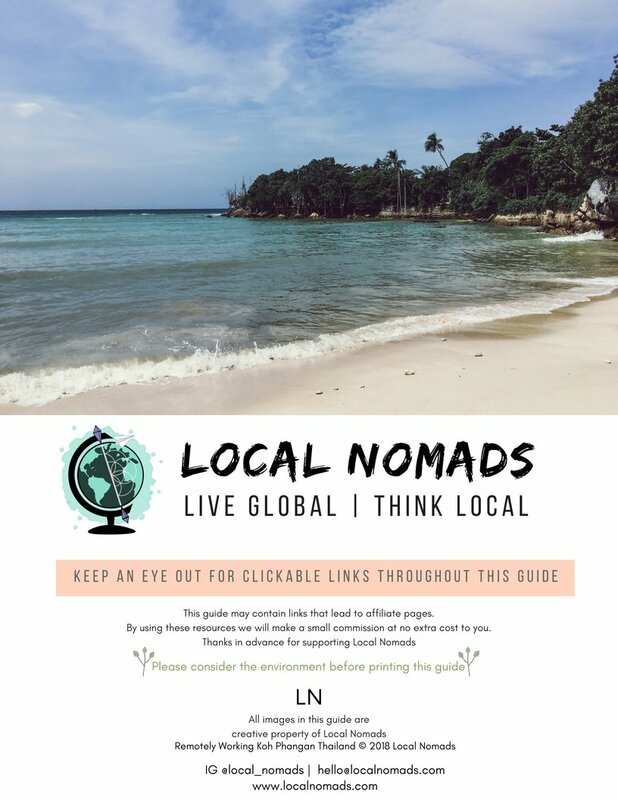 The facebook communities are very active and promote everything from parties and events to yoga and meditation, as well as eco-projects and volunteering that you can involve yourself in. 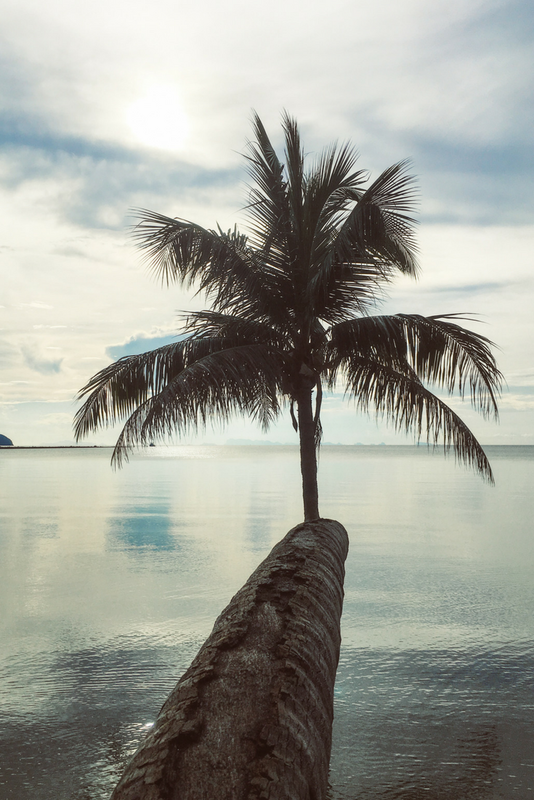 If you enjoy sipping a coconut while working from a hammock as the sea breeze blows gently around you, then Koh Phangan is for you. You'll find a coworking space with just about everything you're looking for. Oh yeah, and they’re open 24/7! 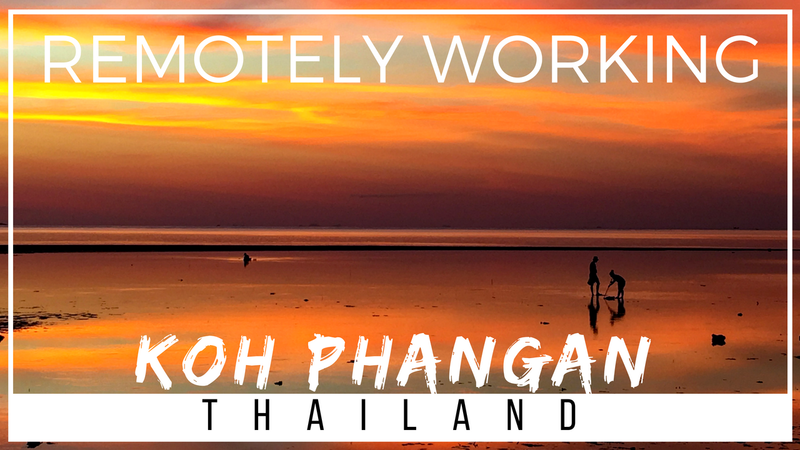 Koh Phangan is the perfect place to wake up early, get on your motorbike, and just explore. You'll find yourself in some pretty interesting places by exploring random jungle roads. 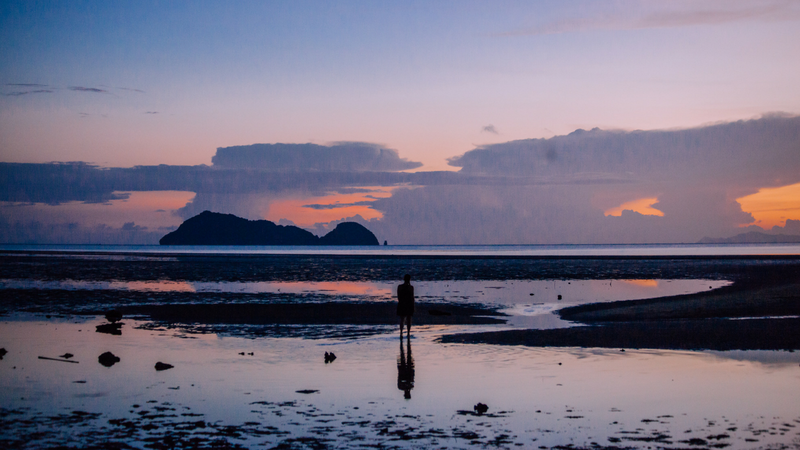 Where do you see yourself spending the most time in Koh Phangan? 1| I need maximum beach time, yoga, meditation, and vegetarian food. 2| I like to be in the heart of the action, with a pumping social scene. 3| I just want to get away from it all. Thong Sala | Thong Sala is a central tourist hub of the island. There’s an afternoon/ night market here, many bars and restaurants, and a ton of touristy shopping. Most people arrive by Ferry at Thong Sala. Here you’ll find a Tesco Lotus for grocery shopping, bike repair shops, banks, and post office. Ban Tai | Just south of Thong Sala, Ban Tai is one of the more major centers of commerce on the island, it’s known for its beaches and nightlife. There are many restaurants and drinking establishments around. We mostly came here to take advantage of the big grocery stores Big C, and Macro. 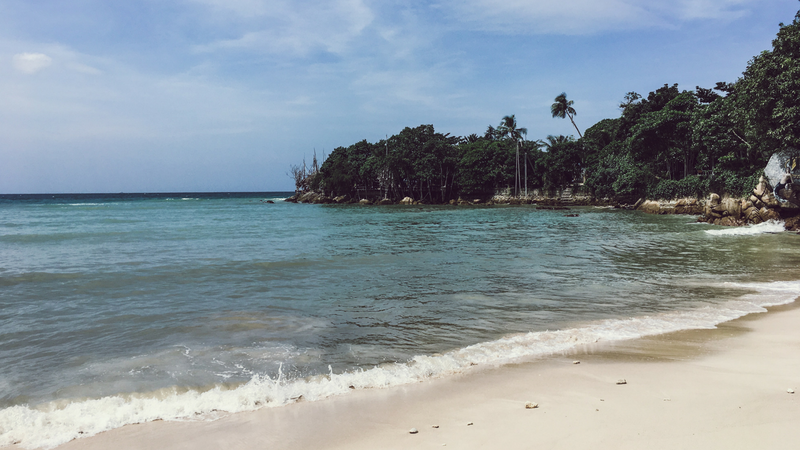 Sri Thanu | The northwest corner of the island is home to Beach Hub, a 24 hr coworking space right on the beach. Sri Thanu is the epicenter of the Yoga scene and conscious community. This area is quieter, with many small beaches, and residential areas. The center of Sri thanu it is fairly walkable if you don’t ride a motorbike. There’s a small community center with a number of restaurants, laundry, a small fruit/vegetable market, and some basic shopping. There are also a bunch of hotels/resorts around. Most people live a few kilometers out of town in the surrounding area as housing tends to be a bit expensive right in town. Hin Kong | Directly between Thong Sala and Srithanu is the beach side town of Hin Kong. You’ll find decent housing options in this area, a few great restaurants and bars, a couple of cafes and a 7/11. Chala Klom | A quiet fishing village on the north end of the island. This is a sleepy place with a local vibe, beautiful beaches, and great “no walls” food options. There are some nice waterfalls and temples to visit in this area. You’ll want a motorbike if you’re going to go anywhere outside of the center of town. Songthaew taxi rides are quite pricey getting to/from this area. Expect about 150-250 baht per person. 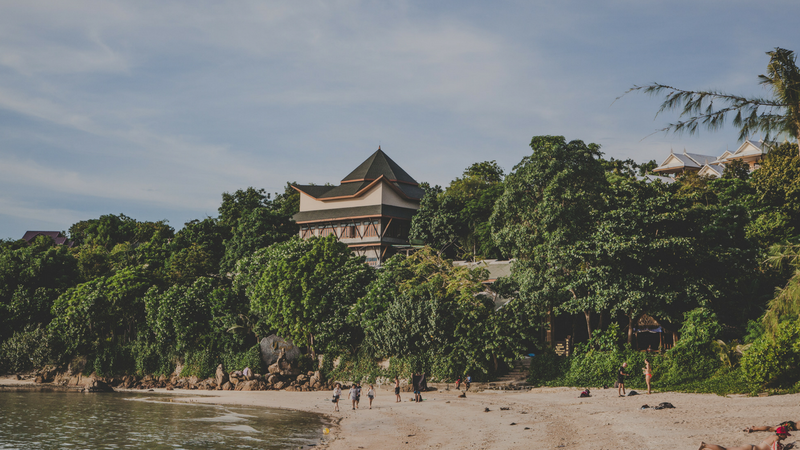 Thong Nai Pan | A super quiet area with two stretches of beach, resorts and bungalows, local food, great views, and all around chilled out vibes. There’s a pretty solid street food market in town. Thong Nai Pan is about a 45 minute from Thong Sala Pier. We loved riding out here for a day trips, and hanging out on the beach or enjoying the views from some mountain side bars. you’ll just need to know what amenities are important to you and your budget. 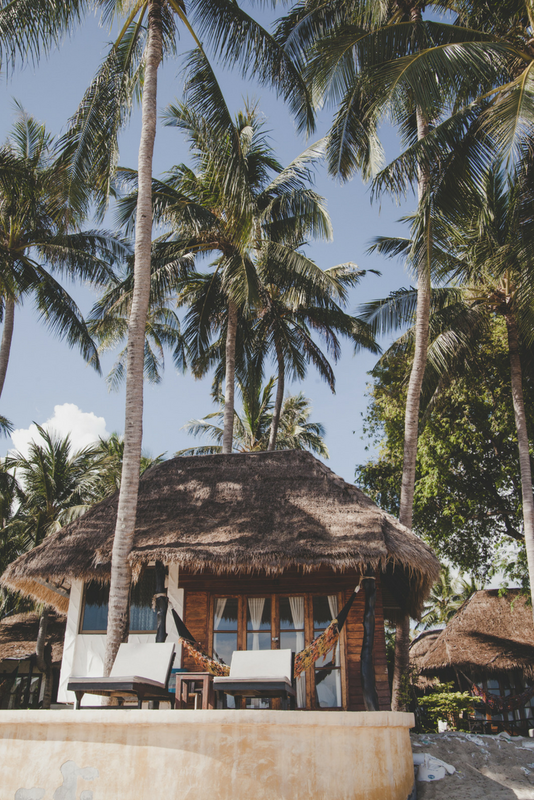 Accommodations range from super basic open air bungalows with fans, to concrete bungalows with kitchens, air-con, and western style bathrooms, to multi-room villas and even beach side resorts. You’ll get a better deal on housing in person and the longer you stay. You won’t find the best places by looking on booking.com or Airbnb. Note: Subleasing is now illegal on the island. For your safety in case of any issues, and peace of mind, we highly recommend you rent directly from the property owner. DAY 2. Visiting accommodations. Put your game face on. Even if you're desperate don't let on. 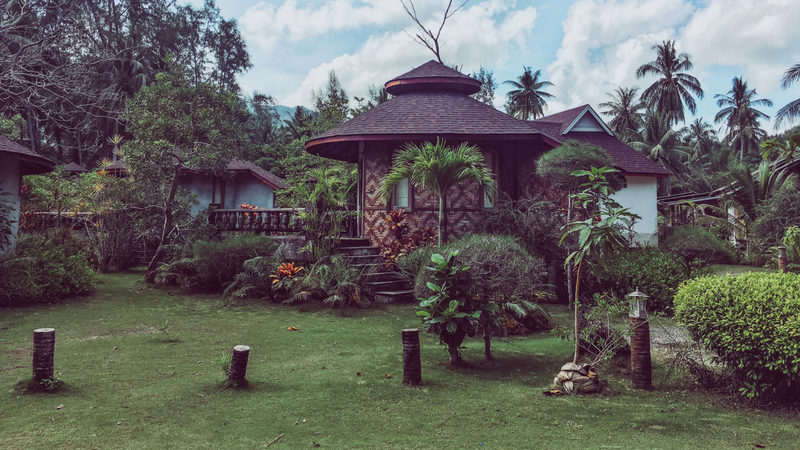 Let the landlord know you're looking at multiple bungalows and villas today and that you're just getting an idea of what's around. Ask to see multiple units, check wifi speeds on your phone, we use an app called Speed Smart, and find out if they offer a discount for longer rentals. Pay rent, and maybe a deposit, and move in. 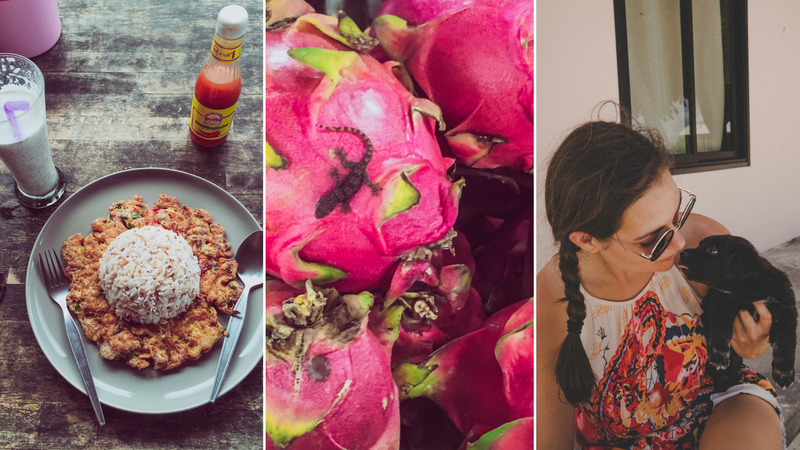 We found a super basic Thai-style bungalow on the beach last year for around $250/month, No air con but it did have a kitchen,we were pretty lucky. For bungalows with beach access, and air conditioning, you’ll be looking around $450-500. Don’t forget to negotiate, prices are flexible especially during the low season. Proximity to the beach, air conditioning, and kitchen facilities will make the biggest difference in the price you pay. Hostels | A great budget option for short term stays and the first few days on the island. There are plenty of beachside hostels in the Ban Tai and Thongsala areas. Wifi speeds can be quite slow depending on the hostel. Do some research online first, and only book for a couple of nights. Bunglaows | These little houses are usually 1-2 rooms with a small bathroom. All bungalows are not created equally. From bamboo thatched or rustic wooden bungalows with a fan, to concrete bungalows with air con and western style bathrooms. Kitchens are a bit of a wild card, but not out of the question. Thai Houses | These often have one to two bedrooms, a small living area, and an outdoor kitchen. They’re built so that the layout is very open, the air blows straight through, and external walls aren’t much of a thing. Koh Phangan houses are built so that the island breeze blows right through them which helps to keep cool. Villas | The villas on Koh Phangan often have several bedrooms, living room, and kitchen. They’re obviously more expensive, but are great if you can get a few people together to rent for a while. They often have really nice views and sometimes even a private pool. Resorts | Definitely more of a short term option. If you want to spend your days getting massages, sipping cocktails, and relaxing on the beach, just a few steps from your bed, then you'll probably be quite happy at a resort. In this case, we suggest you pick your favorite beach first. Koh Phangan is 12 hours ahead of EST (13 hours during daylight savings time) so if you’ve got calls to New York you’ll be starting your work day around 9pm. If your business is based anywhere in Europe, then you’ll be about 6 or 7 hours ahead. Operating on Beijing Time? You're only an hour behind. The 24 hour co working space in Sri thanu will keep you working around the clock. Wifi in Koh Phangan is abundant, although not overwhelmingly fast. Some places are definitely faster than others. Adam was able to successfully teach classes from our bungalow though we did have occasional wifi/power outages. Be sure to download a speed test app on your phone so you can test wifi speeds before making any long term commitments. Sim Cards are cheap and easy to buy. 4G speeds are pretty consistent and coverage around the island is quite widespread. You can pick up a brand new True Move sim card or top up your existing package at any 7/11. For AIS you’ll have to head to the AIS shop in Thong Sala near the pier. Located on the beach in Sri Thanu. Beachub is open 24/7 so you can crush it in any time zone. They have an open air beach side work environment with lots of fans to keep the sea breeze moving. With an onsite cafe and gym, you'll never want to leave...and you won't have to since they have some bungalows for rent. 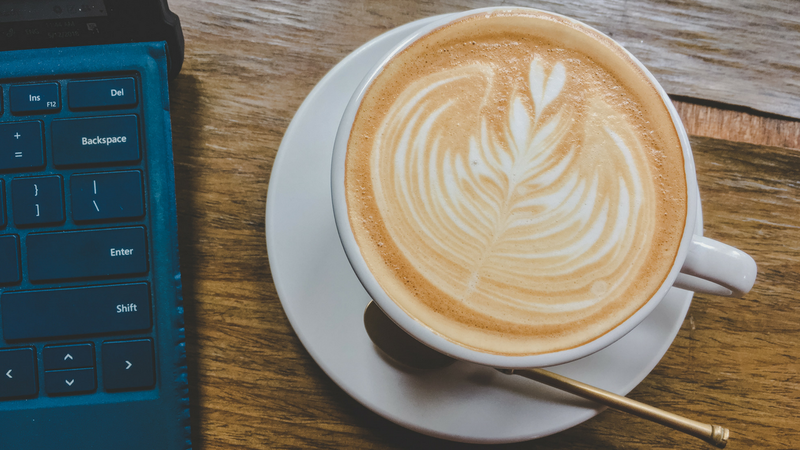 They also have private work spaces and meeting rooms for when you need to concentrate, and community events for when you want to be more social. Check their website for current pricing & details. Trying to stay close to the social scene and also connected to your dayjob? 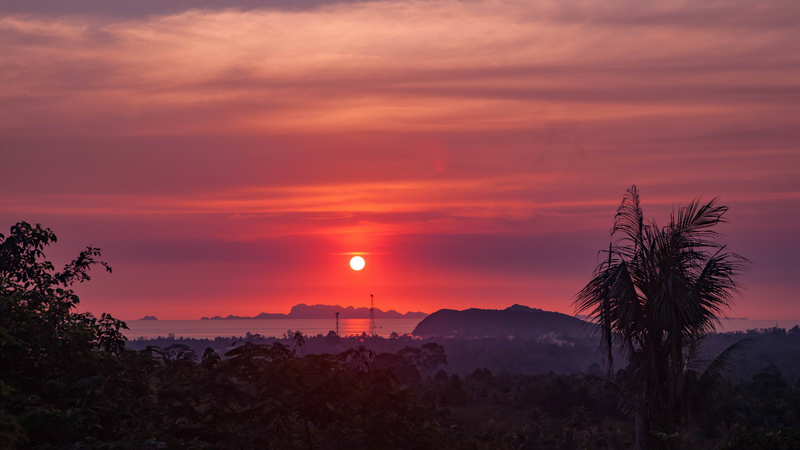 Koh Space is located in Ban Tai towards the South Western part of the island. Open 9 am - 9 pm So you'll always be done working before the party starts. In addition to their shared work space, they also have a shared open air kitchen, and a lounge area on the second floor. Still need a place to stay? Check out their co-living options. For current pricing & details head to their website. 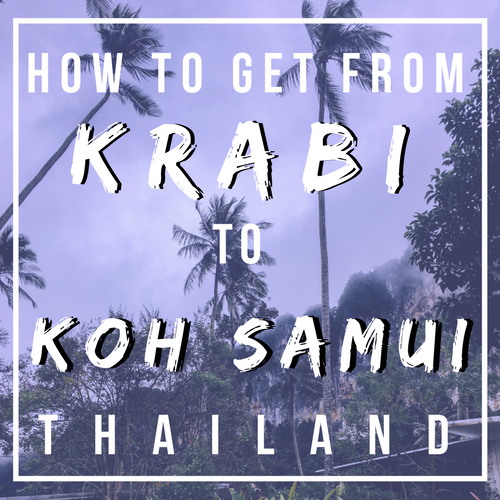 The fastest way to get to Koh Phangan is to fly to Koh Samui, the island next door, and grab a 45 minute Lomprayah Catamaran to Thongsala Pier in Koh Phangan. Flights to Koh Samui are a pretty pricey for Thailand, usually around $150, but if you want to experience one of the coolest airports in the world, it might be worth it, at least once. You can get from Bangkok to Koh Phangan in about 6 hours this way. You can book a Lomprayah Bus/ Ferry combo ticket from most cities in Thailand. Depending on where you’re coming from that could mean an overnight bus trip plus a 3 hour ferry. This method of transport won’t save you time, but it will save you money. From Andaman Coast: You can get from Krabi or Phuket to Koh Phangan in about 4-6 hours with the Lomprayah bus/ferry combo. You can book tickets online up to 2 days in advance. Short notice bookings are easily done from the Lomprayah ticket office, or your accommodation wherever you are. 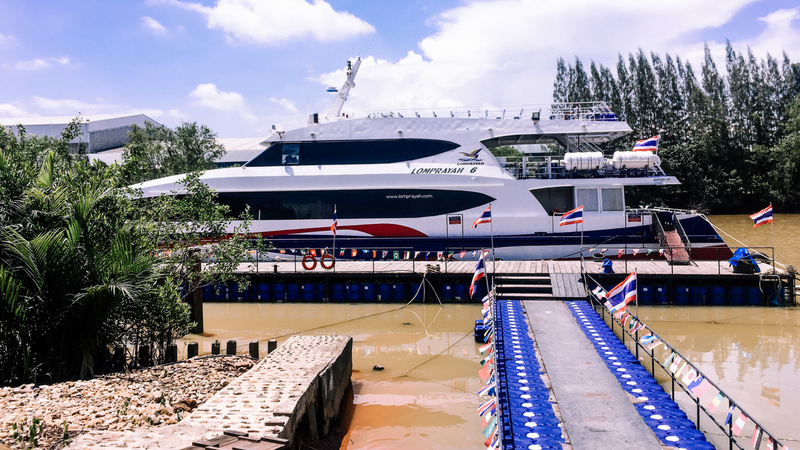 Note: We always use Lomprayah’s ferry service when traveling to or from Koh Phangan. We’ve been burned enough times with other companies, and just won’t risk it anymore. Centrally located in Tong Sala, DOTS has a great working atmosphere with nice lighting, plenty of high tables to work from, and available plugs. The cafe latte was creamy & motivating and the chai latte was magical. They’ve also got a selection of refreshing smoothies, lemonades and teas. North of Tesco Lotus, look for the sign CAKES, CAKES CAKES! While the coffee is good, the cakes are the real stars here. These homemade Russian cake recipes will keep you coming back, to try all the varieties. It seems like they may have expanded since we last visited, not just in their space, but their events as well. On the main road in Ban Tai, Hundred Islands is a great little spot with outdoor and indoor seating. The Cold Brew was on point and the Belgian waffle sandwich was extravagant. The Ban Tai traffic can be a bit noisy, but overall the atmosphere is peaceful. Koh Phangan's hottest cafe is Bubba's. 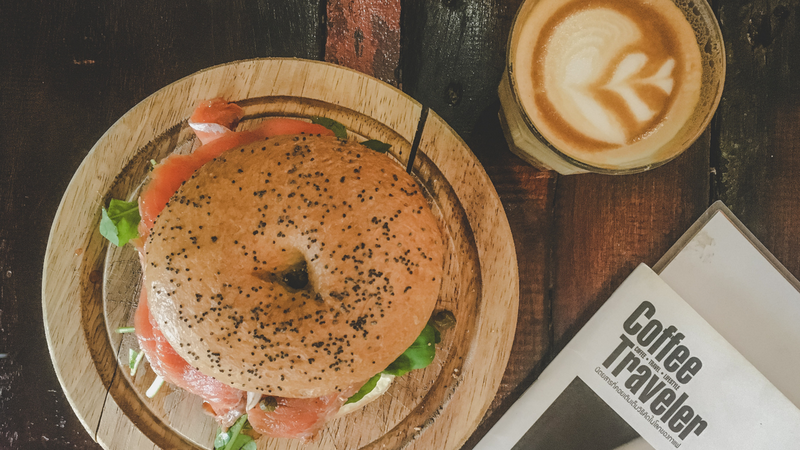 If you're craving a bagel sandwich, in house roasted specialty coffee and an all around chilled out atmosphere, this is the spot for you. The wifi here fluctuates, but it's freshly lit space makes it great for concentrating, or even just nursing a hangover. 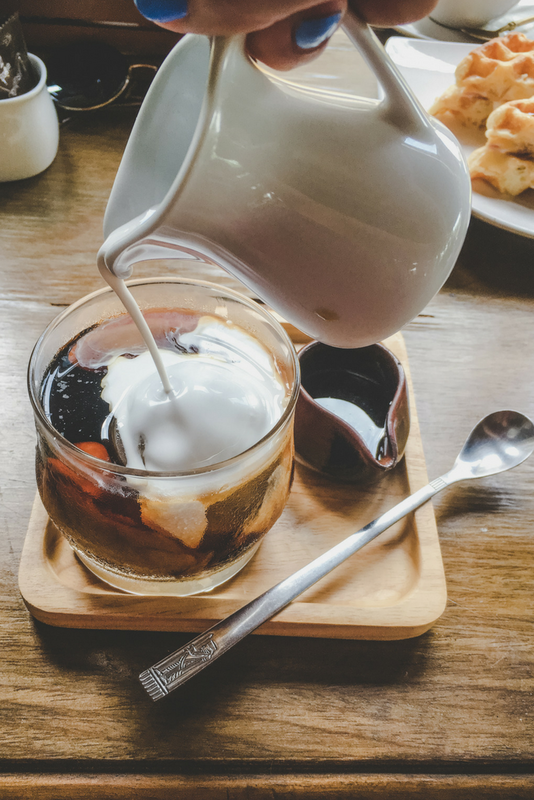 Srithanu | Great coffee drinks, raw and vegan treats, open air atmosphere, and diverse seating. 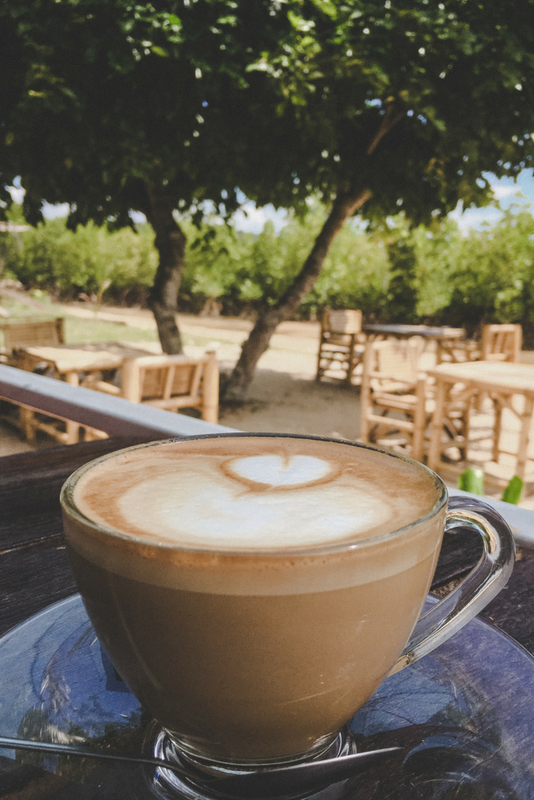 Karma Kafe is a relaxing spot to work from, and it's so close to the beach, you can walk there after you crush it. Their cacao drinks are addicting. If you don’t mind low tables and floor pillows, Art Cafe makes a great vibey spot to sip coffee, eat and work. The smoothie bowls are thick and creamy, and the burrito was a transcendent experience. Coffee was delicious, and they have coconut milk available. 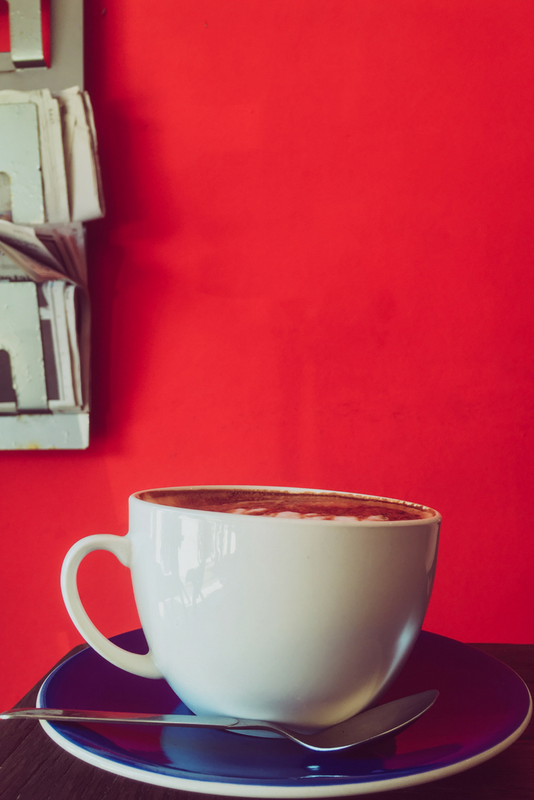 You can get a free coffee if you donate a book! Great spot to curl up with a book on a rainy day. Chaloklum | You'll feel like you've made it to the end of the earth while working from this cafe. You'll be happy the know that at the world's end, there are extra large lattes waiting for you, and bagels. The staff are super sweet, which adds to the enjoyable atmosphere at this a great expat hang out in Chaloklum's sleepy fishing village. 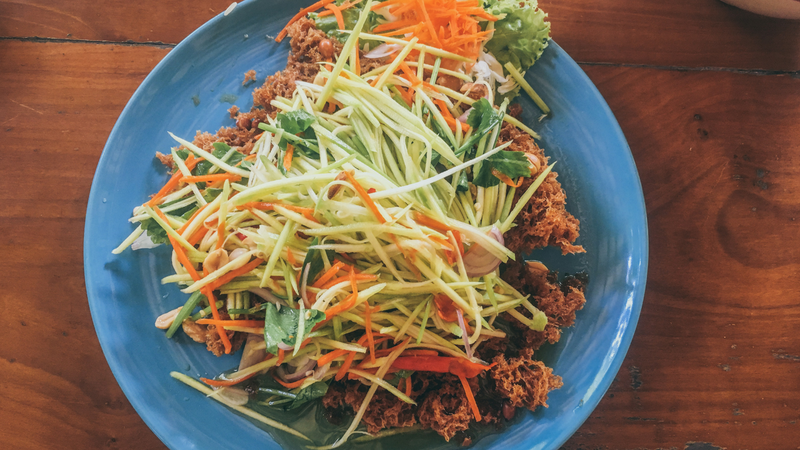 Koh Phangan isn’t known for having the best Thai food around. 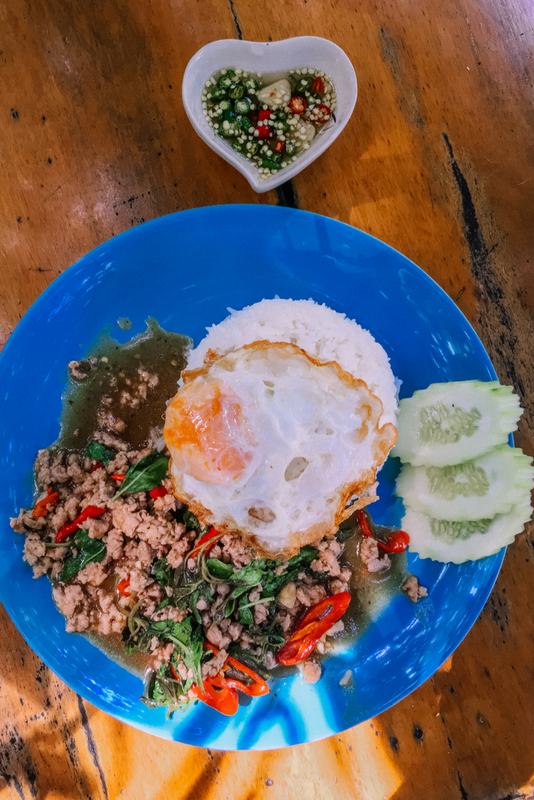 Our mantra for Thai food is “no walls” because the places with the best food often have no walls. With that said, there are some really special places around (with and without walls) that it would be a shame if you missed out on. We visited the local vegetable market in Sri Thanu often for day to day vegetables. Foreigners tend to get overcharged for produce in local markets, so don’t be afraid to negotiate a bit. If you keep coming back they are less likely to rip you off. Just be patient and kind. You’ll find smaller fruit/veggie stands in more local neighborhoods as well. For basic groceries we would ride down to Thong Sala to go to the Tesco Lotus. If we were buying a lot we found Macro in Ban Tai to be the cheapest. We also noticed a lot of locals shop here too. There is also a Big C in Ban Tai if you’re looking for more than groceries. 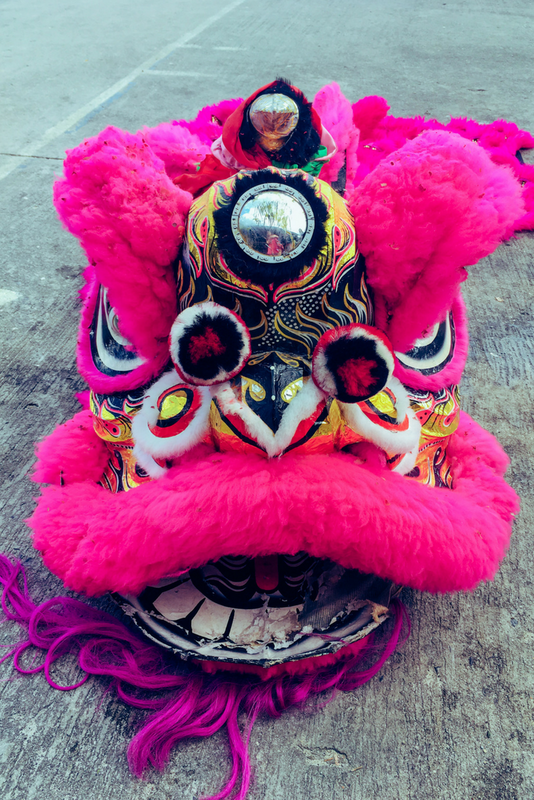 We have a few favorite stalls in the night market including the Pad Thai Cart, the Green Smoothie Cart, The Curry Puff Lady, and Cha Cha’s for general Thai food favorites. Much more than just ice cream. In fact, we went there for the lunch! 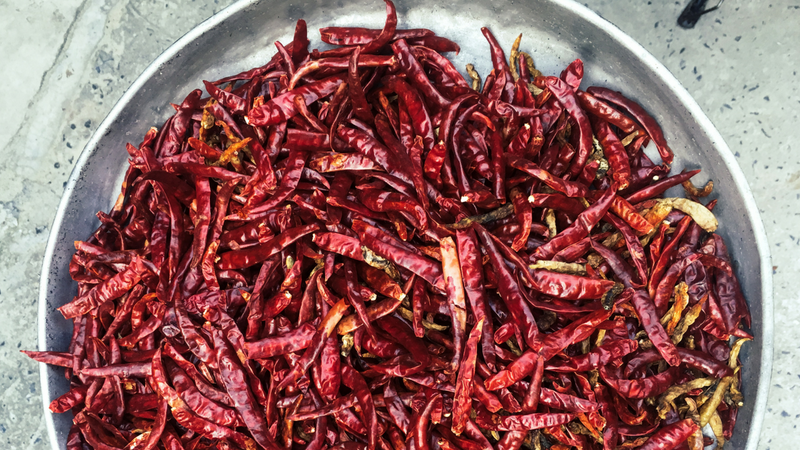 The menu is long with great Thai food options, delicious flavor and they don’t hold back on the spice. Notable favorites were the crispy catfish with mango salad, and the Pad Kra Pow. A cute little lunch spot. Go for the Orange Curry, again and again. Inexpensive Thai Food. Everything on the menu is around 60 baht, their portions are huge, and their pad thai, and no name vegetables are delectable. Way down in Ban Tai, almost the last restaurant, this place is wonderful. The atmosphere is friendly and welcoming, and the food is made with love. Petty’s is a crossover restaurant, serving up some of the best Massaman Curry, and a banging Spaghetti, in a low key outside atmosphere. Go before you’re really hungry, the wait is worth it. Western food favorites, including poutine and an awesome falafel kebab wrap. This is a great spot to hang out. 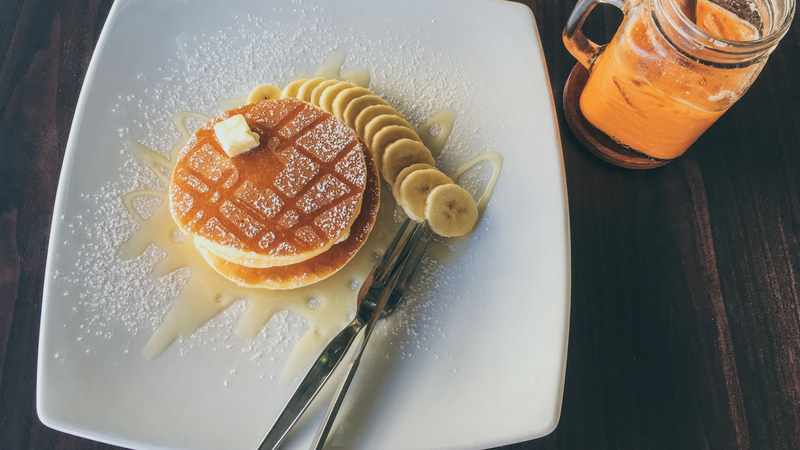 They’re pancakes are mouth watering, the salads are great, and atmosphere is ideal for mornings. All Day Breakfast, need I say more? It’s like this place was transported to the island from England... Wizard of Oz style. You’ll know you’re getting close when you smell mashed potatoes and green beans. Both of us were raised in New York, so pizza is the number one food from home that we crave, and we crave it BAD. We were spoiled to have two good places on one island. I don’t think we’ve visited any place on Koh Phangan as much as Satimi. A good friend of our brought us here and we were in heaven. 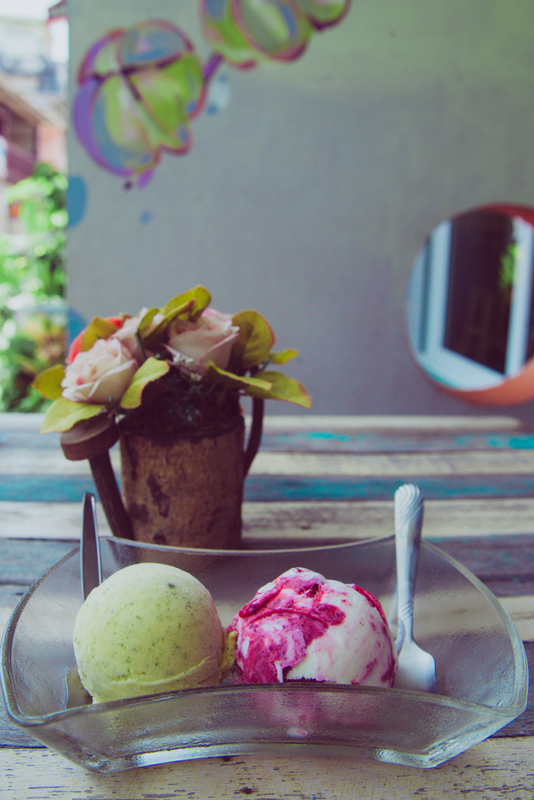 The creamiest homemade gelato style ice cream with awesome locally sourced flavors… like passion fruit mojito. You’ve come to the right island! There are tons of places serving up quality local and international dishes. You’ll have the best luck in Sri Thanu since most of the yoga studios and Ayurvedic practices are in this corner of the island. You’ll also find a few good spots within the Pantip Night Market in Thong Sala. 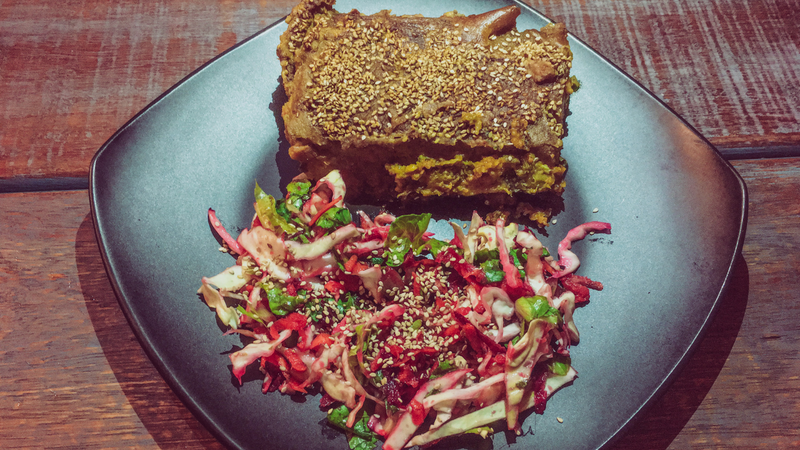 The love put into cooking the food at Akasha Home is unparalleled. And their vegan Greek dishes are remedies for the soul. This place always has a great loving atmosphere. Raw and Vegan treats galore. It's a great place to meet up for lunch, and stay longer for some raw cacao desserts. From the smoothie bowls to the sweet potato burrito, everything coming out of the kitchen at Art Cafe smells like heaven. With a yoga studio directly across the street, it’s a great spot to refuel after practice. Koh Phangan is hot all year round, though it can be very wet at times. 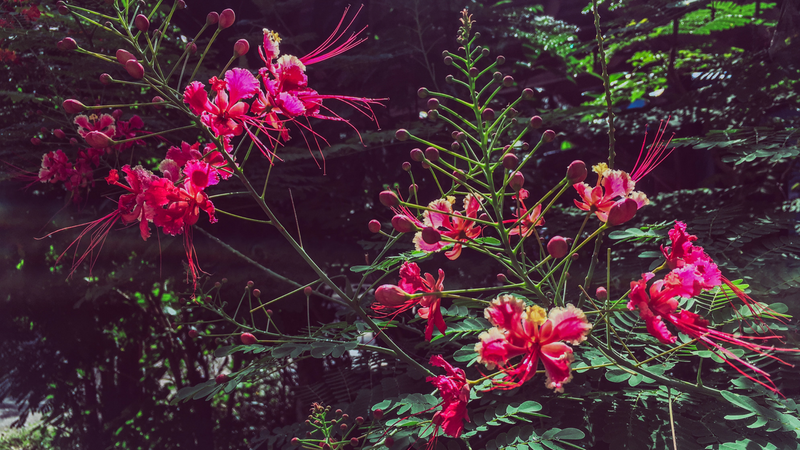 The weather on Koh Phangan depends heavily on the season. Be sure to check out seasonal weather patterns before you make your plans to travel. The first time we visited Koh Phangan was for Gabby’s birthday in November, we were welcomed by monsoons and flooding across the whole island. Temperatures tend to be cooler (around 28C/82F) from December-March, and hotter (up to 40C/104F) from May-August. According to phangan.info the dry season is from Feb-April, Rainy season is from Sep-Dec. There is some rain year round but usually only lasts for a few hours. 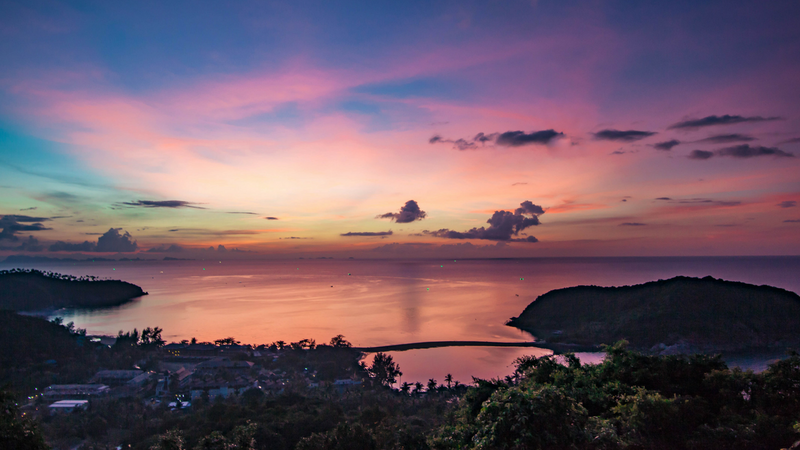 Peak season in Koh Phangan lasts from December to March during the coolest months of the year. The island is less busy during the hotter months from May-August. The Full Moon Party usually happens once a month. The island will get busy for a few days surrounding the party. It can be a lot of fun to people watch during these days. 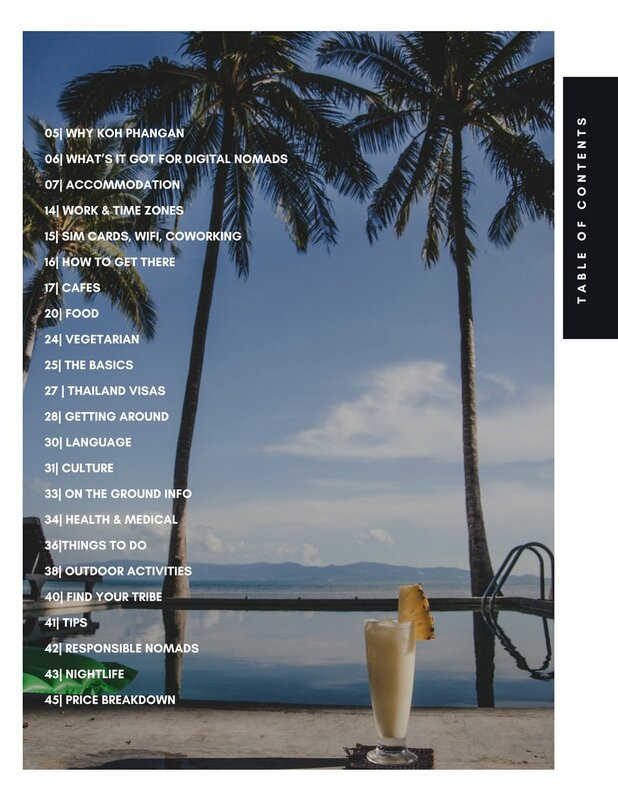 Check out Phanganist for some helpful info on the best time of year to visit Koh Phangan. If your passport comes from any of these countries you can simply get stamped for a 30 day visa exemption at an international airport. (so if your country is on this list, you can stay in thailand 30 days without applying for a visa in advance. If you wish to stay in Thailand longer than 30 days you can also apply for a 60 day tourist visa from any Thai embassy. We got ours from Kuala Lumpur. 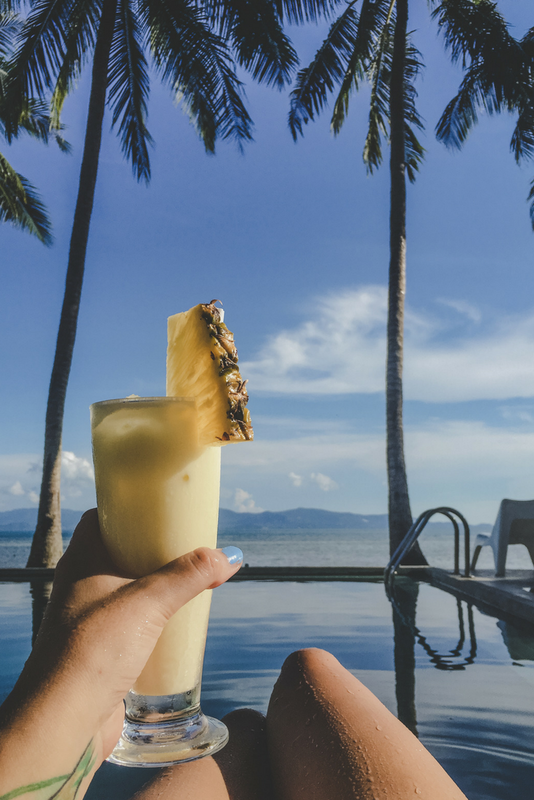 For 30 day visa exemption or a 60 day tourist visa, you can extend your stay in Thailand once by applying for an extension at the visa office in Koh Samui. Things are more spread out on Koh Phangan than in urban Thailand. Getting food or going to the bar most often involves hopping on a motorbike. We found ourselves cooking at home much more on Koh Phangan than we did in places like Chiang Mai. Only good for single riders. These taxis are cheap and will take you anywhere. Familiar with the Chiang Mai Red Trucks AKA Songthaews? The ones on the island are usually dark blue or black. They will take you just about anywhere on the island for a negotiable price. You can flag them down, ask if they’re going your way, and negotiate your price from there. Price will be based on the number of people in your group, distance the driver will be traveling, and likelihood driver will be able to pick someone up when they get there. Expect to pay about 100 baht each from Thong Sala to Haad Rin, 150-200 for Sri Thanu. Motorbike is the preferred method of transport in Koh Phangan. You can rent motorbikes from pretty much anywhere and the price varies depending on how long you’re renting, the quality of the bike itself, and how much you’re willing to negotiate. According to Thai law you must have an international driver’s license to ride in Thailand. It is rare that someone will ask you this when renting a bike. They will ask to hold onto your passport until you return your bike. 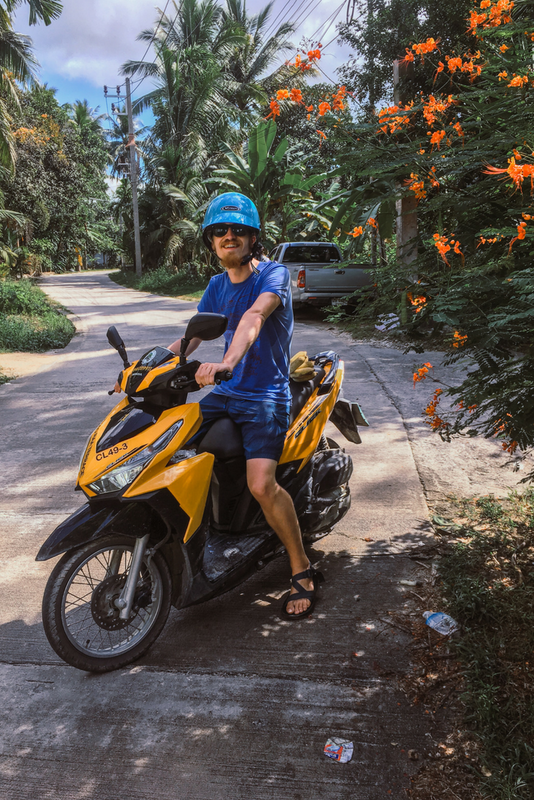 I learned how to ride a motorbike on Koh Phangan. The roads are generally ok, however there are some areas of the island where roads are not paved. You will encounter steep hills and sharp curves which you must be prepared to handle. Don’t get distracted by beautiful views as you ride. Beware of other traffic. Thai drivers don’t follow the same rules you are used to from home. Watch out for other riders and oncoming traffic in your lane. Bigger vehicles always have the right of way. If you’re not moving the speed of traffic keep left and allow others to pass you. Be ready to go around the dogs sleeping in the road. They will not move out of your way. If it’s raining be sure to pack a raincoat. You can buy them at 7/11. You will likely encounter some minor flooding. Common practice is to ride straight through flooded areas if the water is passable. Pay attention to what other drivers are doing. It’s really not bad once you’ve had some practice. There are plenty of bandaged tourists around to let you know that the danger is real. Be sure to wear a helmet always and stay alert. Thai language has a reputation for being difficult for foreigners to speak. We found that learning some basic Thai words and phrases helped tremendously with connecting with people. Don’t be afraid to laugh at yourself when you make mistakes. Showing that you’re willing to try goes a long way. Start by learning the counting numbers, and money numbers. Then learn the Thai names of foods you like to eat. Boom. Now you can order food in Thai. A suffix that is meant to show politeness to the other person. Adding ka (for women) or Krup (for men) at the end of a sentence automatically makes it more polite. Thank you kha is totally acceptable, and Thai people will often use this when speaking English to you. If you enroll in a Thai Language School here you can apply for an education visa to stay longer. There are some good learning Thai language podcasts you can also check out. Thailand is a predominantly buddhist country, but there is also some muslim influence primarily in the South. Images of Buddha are considered sacred and wearing jewelry/clothing depicting Buddha (especially Buddha’s head) should be avoided. It is technically illegal to transport images of Buddha out of the country. Respect for the royal family is very important in Thai culture. Many public holidays recognize and remember members of the royal family. It’s important to never disrespect the royal family in Thailand. 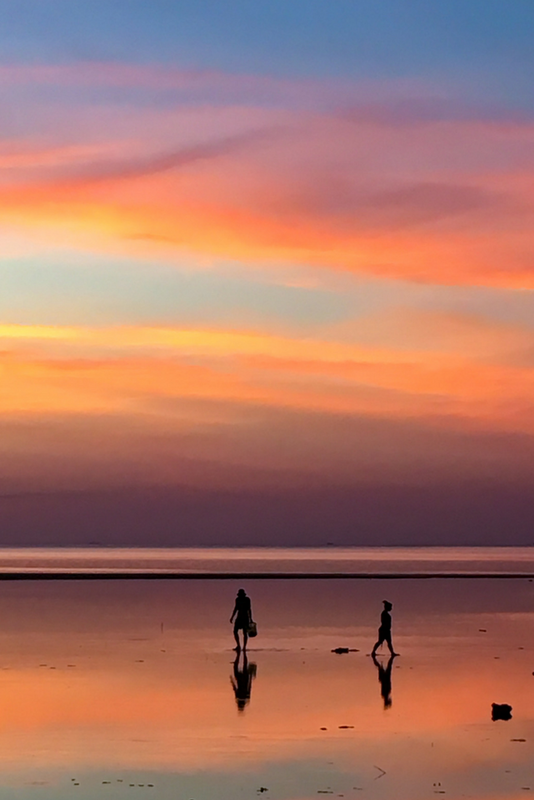 Koh Phangan is a great Island for health and wellness. There are a number of yoga studios, and wellness retreats. Check out reviews on Trip Advisot before choosing a yoga studio. There are 2 gyms in Sri Thanu called Evolve and The Press. If you want a little moreinstruction, consider joining a Muay Thai gym and take up Thai boxing. You can even get a longer visa for this. Wash and fold service is available at most accommodations for about 50 baht per 1KG. There are also self serve washing machines available on the island for 30-40 baht per load. Oh Phangan is not the best place to purchase electronics. There are a few shops in Thong Sala with small devices and cords, but if you need to repair ot purchase new computers and components, head to Koh Samui or Phuket. You need to buy some basic cooking supplies like a kettle or electric burner you can heck Big C in Ban Tai. We also found pillows there for under 100 baht. For plates, bowls, cups, and whatnots check out the “20 baht shop” in Thong Sala (basically a dollar store). Dengue is a mosquito borne illness which causes high fevers, and can lead to reduced red blood cell and platelet count. If you have a fever lasting longer than 3 days be sure to see a doctor. Gabby contracted dengue last year, and needed to be hospitalized for 4 days. All they did was give her on an IV drip to keep her hydrated and tested her red blood cells and platelets daily until they reached a safe level. Sanitation is always a concern in developing places. It’s also possible that the local flora and fauna won’t agree with your digestive system. If you’re experiencing any discomfort we recommend eating some activated charcoal. You can buy them from any 7/11. Look for the brand CA-R-BON. There are many dogs on the island, they hang out on beaches, roads, night markets, and even near the 7/11's and family marts. You don't want to end up at the hospital from a dog bite, use some common sense. Don't approach a dog if it's sleeping, dogs do not like to be startled. Don't bother a dog while it's eating, it might be territorial of it's scraps. Enjoy a morning run? Carry a stick with you, dogs do like to chase, even humans. 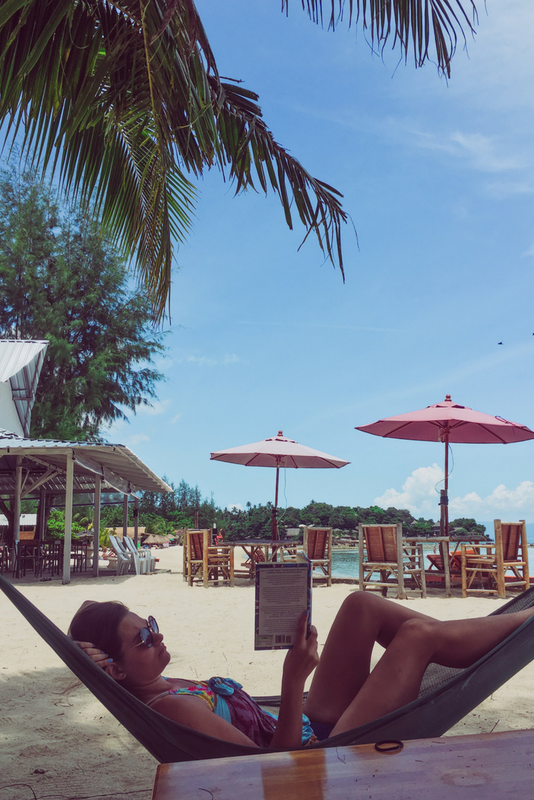 You don't have to twist our arms to spend the morning and afternoon sitting in a hammock with a good book, a peaceful view and the relaxing sounds of the waves gently lapping at the shoreline. The gentle breeze rocking the hammock just enough to encourage a post breakfast nap. Koh Phangan is the perfect place to bring your beach paradise fantasy to life. One of our favorite activities was just to explore the island by scooter. The main road on the north side of the island was developed in 2017 which makes it easier to explore now. Besides the the many hills and curves, the adventures are a plenty. We've been told to be cautious while driving South to Haad Rin, the road can be a bit treacherous. 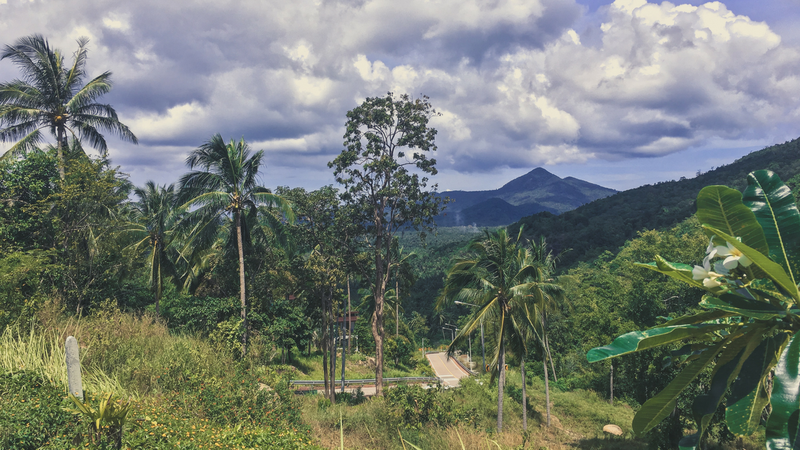 Khao Ra | Hike to the highest point on the island for amazing 360 degree views, or skip the hike an opt for the waterfall instead. Not the most impressive waterfall, but there’s a nice big fresh water swimming area, which provides an alternative to the salty beaches. Usually not too many people here, great opportunity for some skinny dipping if that’s your thing. Bottle Beach | Want to get to Bottle Beach without taking a boat taxi? Take a Hike! There are a number of waterfalls to explore all over the island. 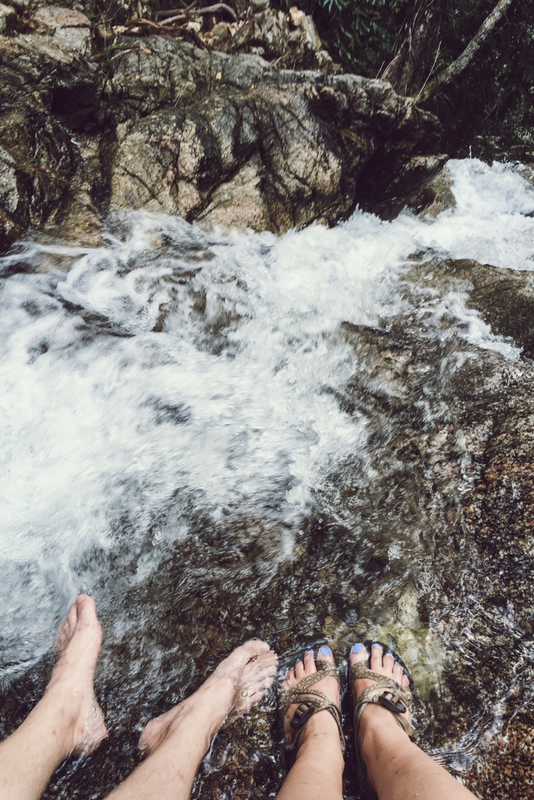 Hike a bit, cool off with a swim, hang with some locals. Snorkeling is one of the best activities on the island. Check out this list to find the best snorkel for you. There are plenty of places to rent/buy snorkels and explore the underwater world. Head to Koh Raham near Haad Son Beach, and Koh Ma. Get your PADI certification while on the island. Most banks have their central branch in Thong Sala near the ferry pier. 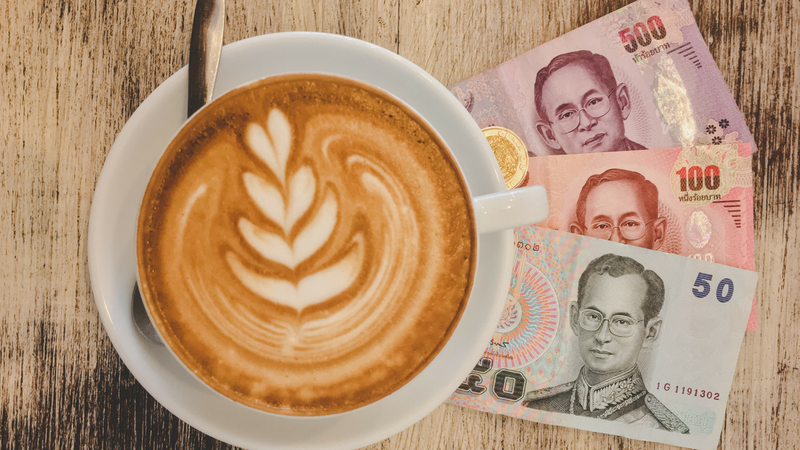 You can take out money from within Bangkok Bank from international accounts without a fee. If you leave your card inside the ATM, contact the bank that is named on the ATM and they can retrieve it from within the machine for you. This may take a couple days. sunscreen (while it is available on the island, it can be expensive and usually has whitening cream in it. Be sure to dress accordingly when visiting any holy sites or spiritual places and government buildings, like the visa office. 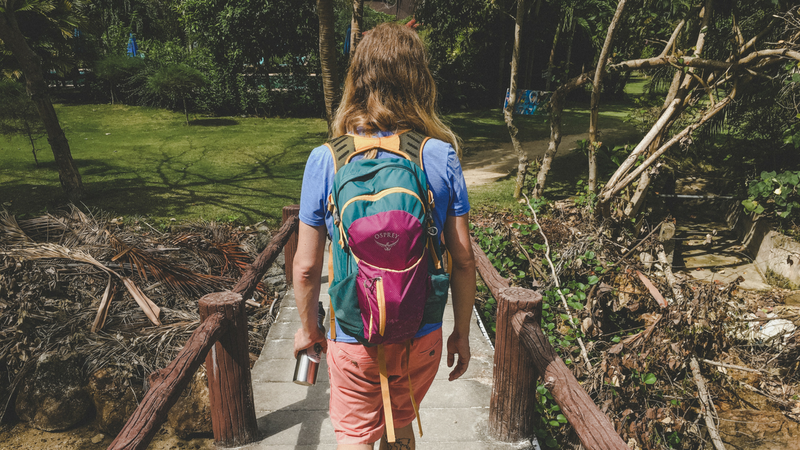 Give back to your host community by picking up trash on the hiking trails, attending beach clean ups and getting involved with local projects. 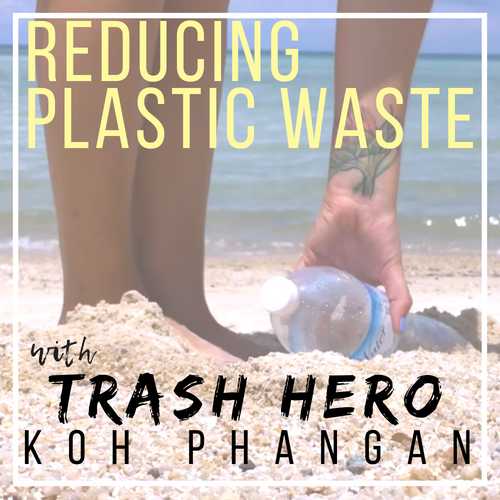 Trash Hero Koh Phangan has created a bottle refill program to reduce plastic waste on the island. Get your Trash Hero Stainless Steel Bottle and refill it for free at a number of locations on the island (and in Southeast Asia) They also organize beach cleanups and promote sustainable building practices! Love Animals? Volunteer with the local animal shelter and PACS and give some love to some dogs who need a friend. Koh Phangan is famous for it's party scene. Haad Rin, Ban Tai, and Thong Sala are popular areas for parties and general nightlife. In addition to the monthly full moon party, there are also beach parties, jungle parties, trance parties...the list goes on. 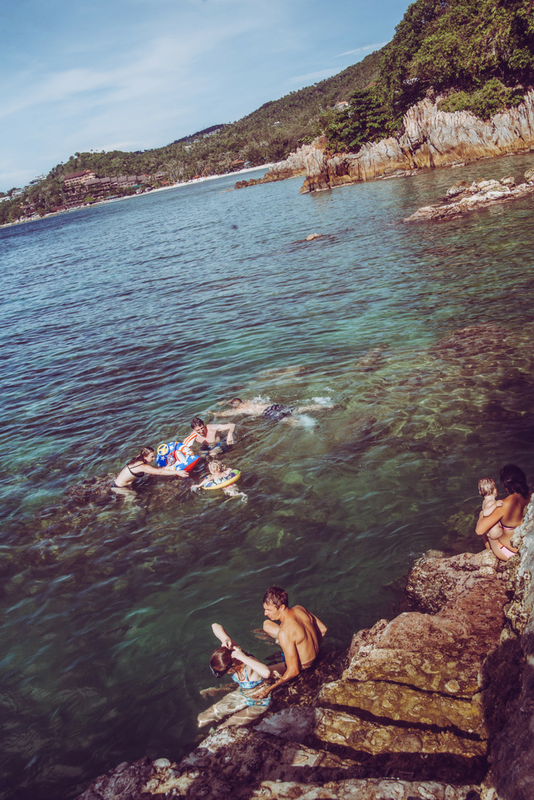 Koh Phangan Unconscious community is the best way to keep up on all the action. Party Central isn't your vibe? How about a chill local music scene? Rasta Home | Friday night is Reggae night at Rasta Home, and everyone comes out to boogie down. Any other day/night Rasta Home makes a great spot to in a while away the hours in a hammock. You'll really feel like you've been welcomed to the jungle. This is our favorite hangout. Jam Bar | Tuesday & Saturday Nights are Jam Bar’s turn to rock out. Don’t miss the weekly open mic jam sesh. Need an even more chilled out evening? 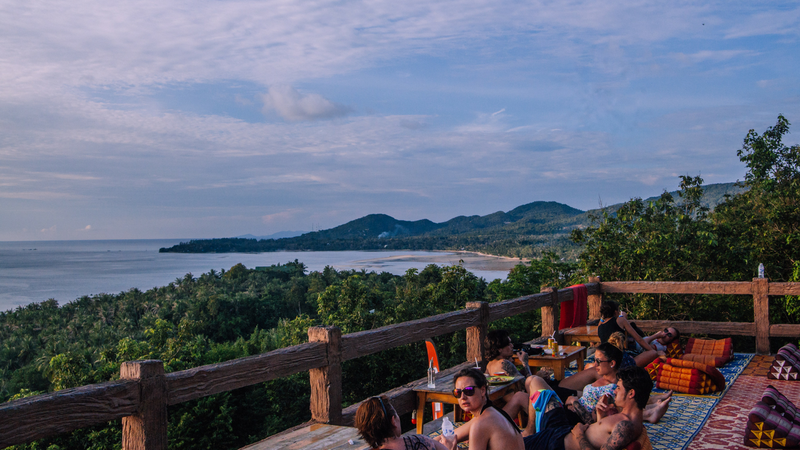 Catch a flick at koh phangan's outdoor movie theater. If you’ve got a 30 day Exemption, then you’ll have no cost for a visa. 60 day visa will run you about 1500 Baht, depending on where you get it done. If you extend your visa it will cost about 1900 Baht and a day trip to Koh Samui. There is accommodation for every price range in Koh Phangan. 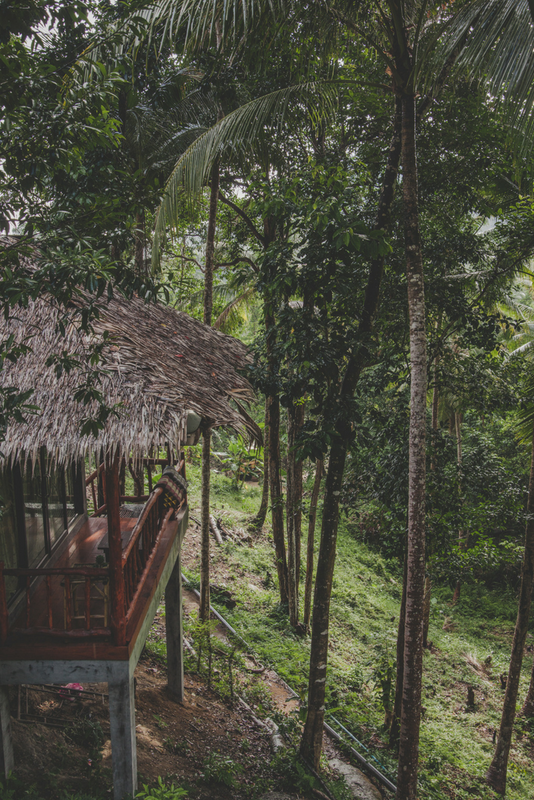 You'll find small rustic bungalows from around $10-15 USD per night. Places with air conditioning will run you about $18-25 USD per night and of course if you're looking for something a little more luxurious you'll find things in the $30-50 USD per night range. Coworking at 24 hr BeacHub will run you $200 for monthly access. Check their website for current pricing. Motorbike Rentals can be arranged for 100-250 Baht per day depending on how long you’re renting for. The longer you rent, the better deal you’ll get. Songthaews can be around 150-300 baht per person, depending on how far you’re going.